Three Card Poker is a reasonably popular poker-based game, but it’s not a true poker game, because you play against the dealer, not the other players. In some respects, it’s more like a blackjack game with poker trappings. But it’s popular because it’s reasonably easy to play, it’s fast-paced and fun, and the house edge is relatively low–in the 2% to 4% range. Three Card Poker could be considered two separate games played at the same time and in the same place. One game is Ante/Play, and the other game is Pair Plus. Both games use standard poker hand rankings. But there are also a couple of exceptions. For one thing, a straight beats a flush in Three Card Poker. And a three of a kind beats both a straight and a flush. Ante/Play is the version of Three Card Poker where you try to beat the dealer’s hand. It’s similar to blackjack, but the winner is determined by the cards’ poker hand ranking, instead of using a point system to try to get close to 21 without going over. In the Ante/Play game, you place an ante, and then you’re dealt a three card poker hand. If you like the hand, you can place another bet, the “Play” bet, which is the same size as your ante bet. If you fold, you lose your ante. The dealer turns over her cards after all the players have looked at their cards and decided whether to bet or fold. The dealer needs a pair of queens or better to qualify. If the dealer doesn’t qualify, ante bets are paid off at even money. Play bets are returned but not paid off in this situation. If the dealer has a hand with queens or better, aka a hand that “qualifies,” then the dealer’s hand is compared to each player’s hand. Winning hands get even payouts on both their ante and their play bets. A straight flush, three of a kind, or straight qualifies for a bonus payout on the ante bet only. This bonus payout gets paid even if the player loses to the dealer. A straight flush qualifies for a bonus payout of 5 to 1 on the ante bet. A three of a kind qualifies for a bonus payout of 4 to 1 on the ante bet. A straight qualifies for a bonus payout of 1 to 1 on the ante bet. Pair Plus is the version of Three Card Poker that pays out based on the strength of your hand. You don’t have to compare your hand to the dealer’s hand to win–if you get a high enough hand, you get a payoff, period. Pair Plus is a non-competitive game that’s similar to slot machines, but it’s even more similar to video poker, since the payoffs are determined by the strength of a poker hand. If you’re playing both options (Ante/Play and Pair Plus), and you fold your ante bet, you’re also folding your Pair Plus bet. But if you had a hand that was good enough to win any kind of payout on the Pair Plus bet, you’d never want to fold that hand in an Ante/Play situation either. When it comes to three card poker gaming online, you want to find the best casino for your gaming needs. There are so many online casinos to choose from, it can be hard to find the right option that suits your game play needs plus offers security, quality bonuses and promotions. Below are three examples of casinos offering three card poker, one for US residents, one with live dealer and one for international players. Read on to see what each casino can offer you. Slots.lv Casino is the best three card poker online casino for United States players. The site not only offers quality slot gaming but also covers table games, including three card poker. At Slots.lv, the game of three card poker is found listed under Table Games and titled Tri Card Poker. There are two versions, a simple option with no table or extras, just three card poker game play; and a version similar to land-based play, offering players a chance to sit at the virtual felt. Both games offer wagering for low and high rollers, with bets of $1, $5, $25, $100 and $500 per hand. New players will have access to a great $5,000 bonus when they sign up at Slots.lv. When it comes to live dealer three card poker, Betway is the top choice for players. While the site does not accept United States players, the casino is a good option for international players. With the live version, players take part in three card poker gameplay against a real dealer. The three card poker table action is streamed live online, so players can make decisions in real time and interact with the dealer. This game also offers better limits, with players able to wager £1 – £3,000. When it comes to three card poker online for international players, Betway Casino is yet another great option. With three gaming options, players will find there is plenty of opportunity to play the game. Choose from standard three card poker or go for the gold with three card poker gold. With the traditional game, players can wager the standard ante plus the Pairs Plus wager. With the three card poker gold game, players will be able to place this side wager as well. Rule #2: The dealer will deal three cards to the player and then three cards for himself. The player will review the cards and the dealer’s cards will remain face down. Rule #3: If the Ante bet was played, the player will then decide to fold or raise. Rule #4: If the player decides to fold, the Ante wager is forfeited. Rule #5: If the player chose to raise, the Play bet must be made and be equal to the Ante bet. Rule #6: Dealer will flip his cards. Rule #7: Dealer must show a queen high or better to qualify in the game. Rule #9: When the dealer qualifies, the hand of the player will be reviewed with the dealer’s hand, with the higher hand earning the win. Rule #11: When the dealer has the higher poker hand, then the Ante and Play wager are lost. Rule #12: When the dealer and players hands are a tie, then the Ante and Play bets are lost. Rule #13: When the Ante bet is made, and the player flips a straight hand or higher, then the Ante Bonus is earned, no matter the value of the hand. Rule #14: The Pair Plus wager will pay the player based on the value of the poker hand of the player. Rule #15: Pair Plus wagers and Ante bet payouts can be seen in payout boxes where you play. High Card: this hand will play if no one has any of the above hands. The person with the high card wins. While playing three card poker online is fun, playing the game in live form can be even more exciting. Players can easily find three card poker in Las Vegas. Most casinos in Sin City offer the game. The best place to play three card poker in Vegas depends on the player. If you are looking for tables at $15 minimum bet, you will find the game at most every casino along the Las Vegas Strip. If you want to play at lower minimums, you want to travel to the north end of the strip. The Circus Circus Casino and the Riviera both offer the game at just $5 minimum bets. Many gamblers prefer to play three card poker online due to ease of access and a few other benefits. With online game play, three card poker comes in varying formats depending on the casino you visit. You might find the traditional version of the game or a unique variant. Three card poker strategy can be built upon by playing the game in free mode, before wagering for real money. This is a BIG advantage. Players cannot walk into a land-based casino and practice the game for free before placing a wager. With practice play, players can check out the game at an online casino before betting real money. If for some reason the game is not enjoyable, no loss is incurred. With online play, players also have the ability to earn bonuses or take part in promotions. While promotions are normally geared towards slot game play, there are options for players to use the game of three card poker to clear bonuses and earn bonus cash while enjoying the game. One of the most popular forms of online gaming available today is live dealer. With live dealer gaming, players have access to casino games as they take place in real time. A studio or casino is used to play the game while the footage is streamed online for the player. The player makes decisions in real time, which can make game play much more exciting. There are online casinos that offer live dealer three card poker online. Players simply choose the game and are given streaming access to the game where the dealer can be chatted with, as the action takes place in real time. 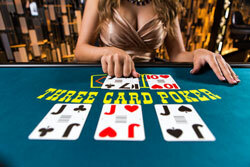 Three card poker is a fun game to play at the casino or online. The game is easy to figure out, once you understand the rules and the poker hands involved. Once you have that information down, its time to move on to strategy or learning tips to improve game play. Below are a few helpful hints to get you started. Tip #1: Paytables will vary based on the casino. Be sure to know the paytable based on Ante bet and Pair Plus to ensure you will receive the best payout for your 3 card poker hand. Tip #2: When comparing paytables, remember you will earn a bigger payoff on the hands that will occur more frequently. Games that pay a 5-4 on a straight and 4-1 on Flush will have a lower house edge than games with 6-1 and 3-1 on the same hands. Tip #3: Ante-Play Combination Strategy. With this strategy, you are going to go for an ante-play combo when you have a hand with a Queen-6-4 or better. If a pair or better is a winner on the paytable for Pair Plus side wagering. Make the bet with the ante-play combo, when you score this hand. This will help you to hopefully earn a profit during game play. Tip #4: Remember hands that do not have a pair or better will be decided upon based on the first high card. A tie will be broken by the second-highest and then third highest. This helps you to know how to bet when you have a hand that does not include a pair or better. The term 6 card bonus refers to a side bet that can be found in three card poker game play. The side bet is based on the highest five card poker hand that can be created from the player and dealer’s three cards. In Las Vegas, this side bet is often found at Caesars Entertainment gaming venues. With this side wager, the higher the hand the better the payout.